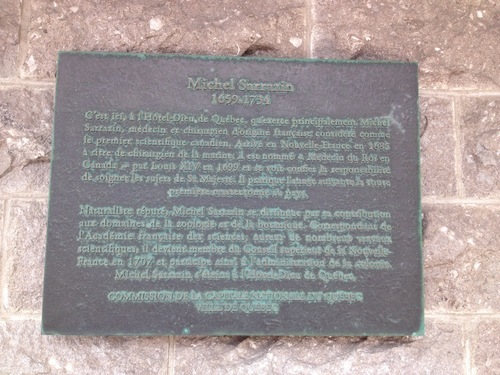 This marble memorial tablet of Michel Sarrazin can be seen at the entrance of the Hôtel-Dieu de Québec in Quebec City. B Trent, Hôtel-Dieu De Québec: The Story Of Canada's Oldest Hospital, Canadian Medical Association Journal. 1985 January 1; 132(1): 56–62. Sylvio Leblond, History Of The Hotel-Dieu De Quebec, Canadian Medical Association Journal. 1949 January; 60(1): 75–80.